After World War II, many African-Caribbean people migrated to the UK. As a result of the losses during the war, the British government began to encourage mass immigration to fill shortages in the labour market. Many West Indians were attracted by better prospects in what was often referred to as the “mother country”. The first Caribbean migrants who settled in the UK became known as the “Windrush generation”, named after the ship HMT Empire Windrush, which brought a group of 802 migrants to the port of Tilbury, near London, on 22 June 1948. The majority of the migrants stayed in the UK, establishing strong communities in the south London boroughs of Clapham and Brixton. On the 70-year anniversary of the Empire Windrush landing in the UK, 2018 has seen the exposure of the Windrush Scandal, a term used to describe attempts by the UK government to deport first and second generation migrants from the Caribbean. 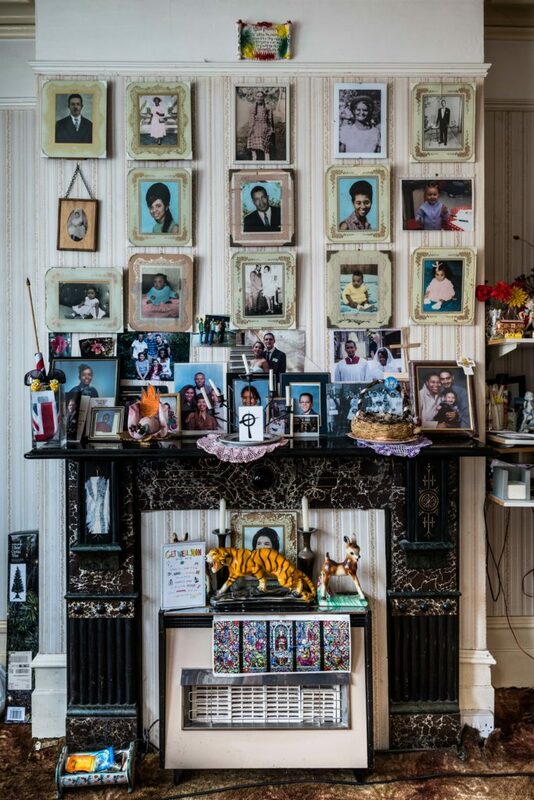 For a year, photographer Jim Grover immersed himself in the world of south London’s Windrush generation – at home, in church and at the domino club. The resulting series of photographs are an intimate portrait of a tight-knit community preserving their unique traditions and culture. We spoke with Jim about this immersive project and his experiences in documenting the “living history” of his local community. First generation immigrants continue to wear their hats, of all sorts, at a traditionally jaunty angle! Three nights a week first-generation Caribbean immigrant men play dominoes in the West Indian Association of Service Personnel (‘WASP’) club in Clapham, South London. The dominoes team, which plays against other local West Indian dominoes clubs, is called WASPS. Stockwell Good Neighbours club was founded in 1974 to provide a community centre for first generation West Indian immigrants. It still meets weekly. Its 60 members are almost all West Indian women aged between 60 and 103. Preparing the ‘rice and peas’ for a ‘nine nights’ celebration in a Jamaican home in Clapham, south London. According to Jamaican tradition it takes nine nights before the spirit of the deceased is finally at rest. The ‘nine nights’ is a time for family and friends to get together to respect and honour the recently departed, ahead of the funeral; it is typically held 9 days after death (and hence everyone knows when to come). Dominoes bounce into the air as a player slaps the table in victory. The game is sometimes known as ‘slap and slide’. In the Clapham Manor Street club, carpet tiles manage to muffle the sound of the slap, but not the exuberant yelps of the winner. First-generation West Indian migrants continue to enjoy playing dominoes, or ‘bones’, in clubs around south London, but the number of players is declining. When they arrived back in the 1950s and 1960’s, the West Indians were at the cutting edge of contemporary dance. 60 years on, whenever the music starts, they still love to dance, serenading effortlessly and gracefully across the dance floor. Could you start by telling us about your route into photography? And when did you first pick up a Leica camera? I used to travel around the world as part of my business career, especially to emerging economies in Africa, Latin America, and Asia. I started to take a camera with me and would use the weekends to explore daily life in towns and villages, and spending time with the locals in their communities. My first Leica was an M9. I loved its simplicity, the images, and its discreteness. So I bought another and then I was hooked! I have been using Leica cameras for around 8 years now and love everything about the experience. You’ve lived in Clapham in South London for 30 years and several of your projects are shot in your local neighbourhood. How would you describe Clapham? And how has the area inspired your choice of projects? Clapham is a typical South London suburb. Its residents include those who have lived here all of their lives, as well as young newcomers stepping onto the London property ladder for the first time. Expensive homes neighbour council flats. It is wonderfully multi-racial with nationalities from all corners of the world, including a strong representation from the Caribbean. My interest in photography lies in telling stories. Stories that are local to me, are about everyday lives, communities and relationships, stories which haven’t been told before, stories which make the unseen seen and stories which can elevate the ordinary to the extraordinary. A tough brief but worth looking for! I am a strong believer that if you look hard enough there are interesting stories to be told on your doorstep; this is my fourth local photo-story in 3 years, all of which have been exhibited and been covered by national media. How did you come to shoot this particular series focusing on the local Caribbean community? I was looking for a new story. One of my fellow churchgoers, who is Jamaican, asked if I’d like to come to his dominoes club in Clapham. I had no idea that dominoes was being played in Clapham by the Caribbean community (even though I have lived there for 30 years!) and thought it could make for an interesting and untold photo-story. So I went along one evening and was captivated by what I saw – mostly Caribbean men in their 60s-80s playing dominoes competitively but also just enjoying friendship and community. As I spent time with more of this community, including Caribbean women, I realised that there was a much bigger story to be told, a story about how the first generation of Caribbean migrants are living their lives in South London true to their very distinctive traditions and culture (dominoes is just one example!) and mostly unbeknownst to those outside their community and living alongside them. And then I discovered that the 70th anniversary of the arrival of Windrush, the ship that brought the first group of around 500 Caribbean migrants to Britain in 1948, was in June of this year. It was going to be a ‘big event’ so that gave me a focal point for the completion of the project and an exhibition. Monica, who arrived in south London from Jamaica in 1964, being ‘ashed;’ in her church of St James’s in Clapham in February 2018. Monica has attended her church some 5000 times over the last 47 years. First generation Caribbean immigrant women are typically very strong in their faith. Gilbert Clark honours those who sacrificed their lives in WW2 in service of ‘The mother country’ at the 2017 remembrance day service in Windrush Square, Brixton, south London. Gilbert, now 93 and from Jamaica, served as a radar mechanic. Some 16,000 West Indians served in WW2 with 236 killed or reported missing. Their contribution is often overlooked. What were you hoping to capture with this outstanding series? I wanted to bring to life the totality of the distinctive lives that this remarkable generation are living in South London today. I so respect and admire what they have achieved, created and given to us. The more I explored their lives, the more traditions I discovered which I needed to document, such as ‘Nine Night’ (a funerary tradition); ‘Open House’ (regular Friday evening family get-togethers); their distinctive funerals; their strong communities; the strength of their faith, among many other things. I also recognised that as this first generation passes away some of these traditions will weaken and likely be lost forever, and hence I was also documenting ‘living history’, which made the project important in my mind. Your photographs display a truly heartfelt, intimate view into an otherwise little-known community. How long did you spend working on the exhibition “Windrush: Portrait of a Generation”? And how did you manage to achieve the level of access that you did? I started work in June last year and spent 11 months photographing the community. I like to give myself time to immerse myself in whatever story I am seeking to tell and to really get to know the people and their communities. Of course ‘access’ is the most precious thing for any documentary photographer. In my experience it takes a combination of time to build relationships and trust, an authentic interest in people and their stories, tenacity (I was constantly asking people for advice, suggestions, ‘leads’, and invitations to events I wanted to photograph), and a warm smile! Your series covers topics such as faith, community, friendship and death. You were even granted access to a Jamaican funeral and the Nine Night mortuary custom. How did you go about photographing such a sensitive event? How did you know when use your camera and when to simply observe? Sensitivity and respect are hugely important in these sorts of projects. Of course I had always been invited and that gave me ‘permission’. Those attending the events, who didn’t know me, rightly assumed that I had been invited by the host. I just rely on my instincts as to when to put the camera down and if it’s clear that someone doesn’t want to be photographed, then I won’t. But I think you also have to have courage and confidence to take pictures of very sensitive and emotional moments and to get (sometimes very) close to the action, even it feels uncomfortable. If you don’t then you won’t get images that convey the emotion and drama of what you have experienced and that’s a missed opportunity, which you may never have again. First generation Caribbean homes (irrespective of how crowded they were with owners and tenants) would typically have a (very!) special room called ‘The Front Room’, which was kept locked and only used on special occasions. It would be filled with glass cabinets; ornaments; artificial flowers; family portraits; pennants; a gramophone (such as ‘The Blue Spot’). They have now largely disappeared. Two of these images are of domestic settings, in which we can see almost shrine-like constructions of framed photos and diverse memorabilia. Where were these photos taken? And what significance do they have for your series as a whole? These were taken in two homes of Caribbean residents in Clapham and Brixton. One of the things I was determined to find and photograph was ‘The Front Room’. 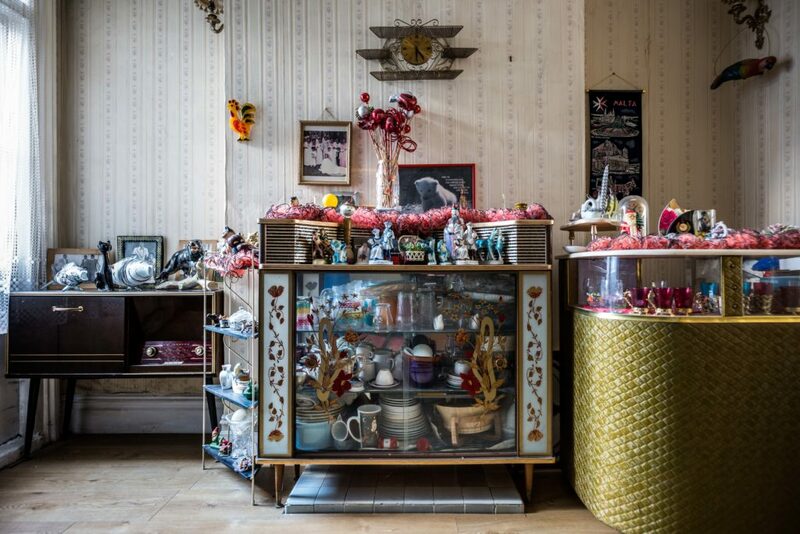 They were so common in Caribbean homes in South London in the 1960s, 70s and 80s, and were very distinctive and remarkably uniform in what they contained. They have now almost completely disappeared and are thus just one example of the ‘living history’ that my story embraced. The term “Windrush Generation” refers to first generation immigrants to the UK from Caribbean former colonies of the British Empire, with 2018 marking the 70th anniversary of the Empire Windrush arriving in England. Did you manage to meet with any first-generation “Windrushers”? And if so, what stories did they have to tell of their arrival in the UK? My project was focused on the first generation of ‘Windrushers’, who mostly arrived between 1948 and 1962. So I spent a lot of time with this remarkable generation. Just like I knew I had to find a ‘Front Room’, I also I knew that I had to find a ‘true’ Windrusher, a passenger on the ship back in 1948. My search eventually led me to Leeds, and to the inspiring Jamaican, Alford Gardner, who is now 92 and one of the tiny number of survivors from that original voyage. As the project unfolded I decided that it was important to document some of these personal stories and to include them as a supplement to the images. So I recorded and transcribed 11 life stories (the transcription of long conversations into short life stories proved to be much harder work than I initially envisaged!). They include three first-generation migrants, now in their nineties, as well as two from the second generation who were born here and who described how they have gone about seeking to hold on to the traditions of their parents. It was fascinating for me to see how many exhibition visitors sat down to read the transcripts in the gallery; many read all eleven! They proved to be so popular that they are now included in the second edition of the book of the exhibition which will shortly be published. You shot this series of photographs with the Leica SL, Leica M Monochrom and the Leica Q. How did you decide, which camera to shoot with? And what do you see as the advantages of each of these particular cameras? I’ll often take all three with me (with M lenses on the SL). I just love the Q and working with the 28mm lens. It forces me to get really close and into the heart of the action and has the potential to create real drama in an image (and the autofocusing speed is terrific). The Monochrom is wonderful in poorly lit spaces (for example dancing with very little lighting) with very high ISOs. And the SL is great if I want to use a longer M lens, say a 75mm or 90mm, than my usual 35 or 50mm, as well as for studio-style portraiture (which also featured in my exhibition, using the 24-90mm lens). What projects are you working on at the moment? And what can we look forward to seeing you in the future? My current focus is exploring the feasibility of a tour of this exhibition given its popularity (we had almost 13,000 visitors in 17 days, including 2,500 on the last weekend!). I am also working on an expanded second edition of the book to accompany the exhibition (the first edition sold out almost immediately). I have been commissioned to produce a new photo-story, which will also be exhibited in the Oxo gallery on London’s South Bank in May 2019… so watch this space! And finally, what one piece of advice would you offer to anyone looking to improve their documentary photography? Give yourself time to really immerse yourself in the story and all of its surrounding narrative. Take a look at more of Jim’s work, including his immersive local projects, on his website and keep up to date with his latest exhibitions by following him on Instagram.